The seismic renovation of California Memorial Stadium reached a milestone this week with the installation of a 300-foot-long press box above the western side of the stadium. 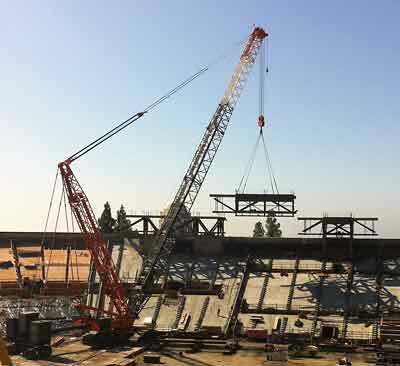 A crane – one of the largest in the country – was assembled last week inside the stadium bowl, and on Saturday, Oct. 8, lifted the first two of five steel-frame sections into place. These lifts, called “picks,” were followed by a third pick on Sunday. After shifting position, the crane installed the fourth and fifth sections on Tuesday, Oct. 11. After the steel frames are mounted atop the towers, the second story of the press box and the roof, façade and furnishings will be added to produce a sleek, glass-and-steel structure. 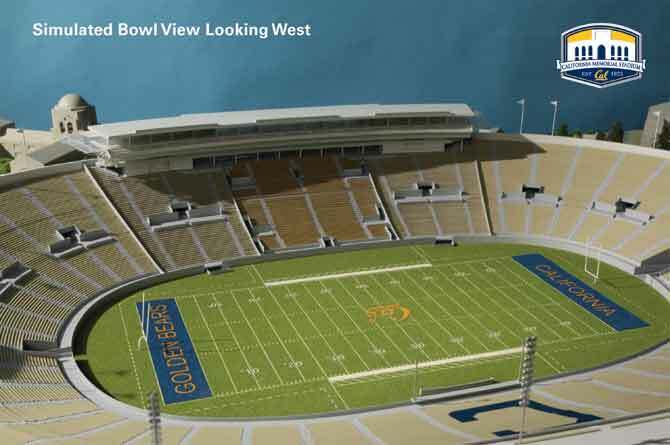 On game days, it will accommodate sports reporters, coaches, officials, alumni and donors, providing an outstanding view of the field and a spectacular view of the bay. The public can view the installation and further construction from a vista point platform on Stadium Rim Way at the northeastern edge of the stadium. The stadium is expected to open for the first football game of the 2012 season.